Clorox is a household name, everyone knows it. Viva however is new to the block, or at least new to my radar. I picked them up originally because I was couponing and found a great deal. Now that I’ve tried them, I’m hooked. It’s funny, I love them so much I’m running around telling people how much they have to try them! Now with Clorox BLAHBLAHBLAH spray, it’s like the newest all-star team! 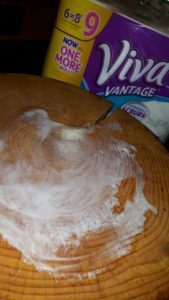 Viva Paper Towels are even strong enough to scrub the chopping block! Win! I bought mine at Wal-Mart recently, didn’t even have to go inside thanks to the fabulous pick up they have now! It’s great for when I have a hundred errands to run because I can place the order in advance, they’ll do all the gathering and then I simply have to pull up and let them know, then my groceries are delivered right to the car! No worries, no hassle, just on my way! It’s especially great when the kids have fallen asleep in the back while I’m running around! Saving time not enough? You can also save money on them with ibotta! 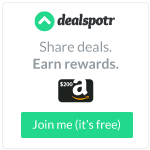 If you haven’t tried it out yet, it’s super simple and a guaranteed way to get money back on some of your purchases! Viva currently has a deal (we are now stocked up on paper towels AND I got a rebate!) I love using ibotta to have a little extra stashed back for holidays or emergencies! They pay you directly to paypal in just a few days when you cash out so I know it’s going to be there when I need it! My favorite use? Cleaning up the sticky finger messes after watermelon or popsicles, like these amazing Strawberry IcePops! No matter how hard you try, it never seems like you can completely keep the sticky off of everything! 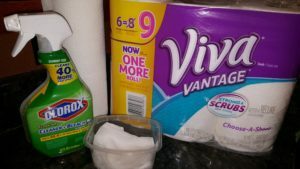 With my DIY Clorox wipes and viva paper towels, clean-up is quick and easy. I put them in small containers so that I can keep them in my car, ready for any mess, any time. I will admit, my friends think I’m totally winning life when we’re at the park and I have those handy! Quick and simple: since Viva are already in half sheets, simple fold again and place in a container, then pour on Clorox Clean Up Cleaner with Bleach and you are ready to go! 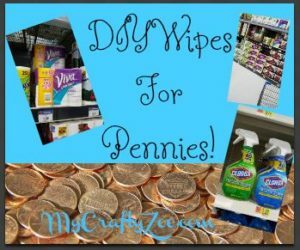 I love having them on hand around the house and I don’t have to spend a ton extra on buying pre-made wipes!